Hi Lionel. I might have been a bit unclear in my previous message. What I meant is, would you let me have your database which includes all Level 10 teams plus the select few leagues you have done at Level 11? I am wanting to start a new save with a Level 11 team which you have already created in the Shef & Hallam League. As for other leagues at Level 11, I am more than happy to get you some information over the weekend. I have not added the leagues in at level 11, for now I am just putting the data in, the leagues are put in after I have finished so I don't get mixed up with promotion/relegation etc. It would not work proper anyway because all the teams relegated from the northern counties east league division 1 would go into the Sheffield league because of all the missing leagues at level 11. Tell you what would be brilliant if you were willing to do it. For those of us with modest rigs, a full 11-level database could slow up the processing too much. 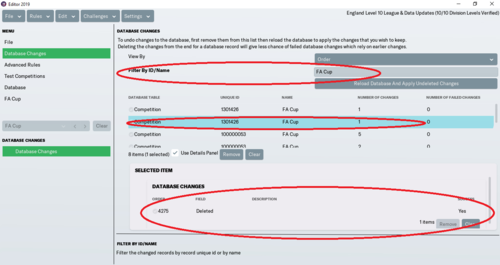 If, in addition to a full 11-level database you could also put out separate one such as 10 levels + L11 Sheffield, 10 levels + L11 Wiltshire and so on, we could choose which L11 league we wanted to start in and still have a manageable size. I am going to try and do a full Level 11 database but it depends on if I can get all the information for the leagues. The trouble with adding out single leagues is that the structure will not work properly because of more teams coming down from higher levels into incorrect leagues. 3 Leagues at Level 11 now fully completed. I did not add in away kits unless I had the information, how do you add in generic kits? I probably worded that badly, I just meant that if every team is given an away kit, doesn't matter what, then it allows us to drop custom kits on top, but we can't if it isn't there to begin with. As long as the team you copy to use as your base has one, it's all good (if that's how you do it). As an aside, I just bought in the in-game editor to try to solve this, but if I add the away kit it not only doesn't allow my custom kit pic to overwrite it but it also seems to disable my existing custom home kit, with no amount of cache clearing and skin reloading bringing it back, so I'll have to make do with the plain white kit as my away kit. If you decide to update it on your next pass, pics of home away kit attached. I updated the 1st page download with the updated kits. Bradford Olympic (aka 'The Olympic') - based in Bradford; play at Eccleshill Sports & Social Club. Founded date seems to be 2017. Home kit is all black with red stripes on the lower half of the shirt. Away kit is red shirts and socks with white shorts. Golcar United (aka 'Golcar Boys') - based in Golcar, Colne Valley; play at Longfields Rec, Kirklees. Can't find date founded, 2004 appears to be earliest. Home kit is green and white checked pattern, with black shorts & green socks. Away kit is black shoulders and chest above dark green. Lepton Highlanders - based in Lepton, Huddersfield, play at Lepton Highlanders Sports & Social Club. Founded 2015. Home kit blue and white striped shirt with blue socks and shorts. Away kit is red and black stripes, black socks and shorts. Littletown FC - based in Heckmondwike; play at Beck Lane. Founded 2013. Home kit is all burgundy with light blue trim. Assume away kit is the reverse! Lower Hopton AFC - based in Mirfield; play at Woodend Road. Can't find date founded, 2009 appears to be earliest mention of them. Home kit red shirts, black shorts, red socks. Away kit appears to be yellow shirt and socks, blue shorts. Overden West Riding - based in Calderdale; play at Wainstalls, Calderdale. Founded 2017.Hhome kit is yellow shirt and socks with black shorts, all red for away. Ryburn United - based in Ripponden, Sowerby Bridge; play at Ripponden Wood. Founded 1969. Home kit is red and black stripes, away kit seems to be light blue and white stripes. TVR United - based in Bingley; play at the Zara Sports Centre. Can't find date founded, 2013 appears to be earliest mention of them. Home Kit is all red. can't find an away kit. They are really hard to get any info on at all! Beeston St Anthonys (aka 'the Saints') - based in Beeston, Leeds. Play at St Anthony's Road. Founded 2014. Home kit is all green, away kit is light blue shirts and socks, claret shorts. Carlton Athletic - based in Carlton, Wakefield. Play at Town Street, Carlton. Founded 2005. All blue home kit. Away kit is maroon shirt and socks with white shorts. Field AFC - based in Bradford; play at Field Sports and Social Club. Founded 2005. all green home kit, all blue away. Headingley - based in Headingley, Leeds. Play at Weetwood Playing Fields, Leeds. Founded 2001. Home kit is all blue. Away kit is burgundy shirt and socks with white shorts. Horbury Town (aka 'The Town') - based in Horbury, Wakefield; play at Slazengers Sports Complex, Horbury. Founded 1997. Home kit Red shirts and socks, black shorts. Away kit Yellow shirt, white socks and shorts. Huddersfield Amateurs - based in Elland, Halifax. Play at Old Earth, Elland. Founded 1905. home kit is light blue shirts and socks, white shorts. Away kit is dark blue and light blue hooped shirt, dark blue socks and shorts. Hunslet Club - based in Leeds, play at The Hunslet Club. Founded 1940. All green home kit with yellow detail. Away kit white shirt and socks with dark blue shorts. Ilkley Town AFC (aka 'Town') based in Ilkley; play at Ben Rhydding Sports Centre, Ilkley. Founded 2013. Home kit is all dark blue with yellow detail. Away kit is red shirts and socks, black shorts. Knaresborough Town Reserves (aka 'The Boro') - based in Knaresborough, near Harrogate. Play at Manse Lane, Knaresborough. Founded 1902. Home kit red shirt and white shoulders, black shorts, red socks. Away kit yellow shirt and socks, black shorts. Leeds City - based in Adel, North Leeds; play at Church Lane. Founded 2006. Home kit white shirts with dark blue socks and shorts. all blue away kit. Rawdon Old Boys AFC - based in Leeds; play at Billing View, Rawdon, Leeds. Founded "over 100 years ago" (helpful!). Burgundy shirt and shorts. light blue shirt sleeves and socks for home kit. Away kit is bright yellow shirt with black socks and shorts. Robin Hood Athletic - based in Rothwell, Leeds; play at the Coach and Horses,Rothwell. Founded 2011. 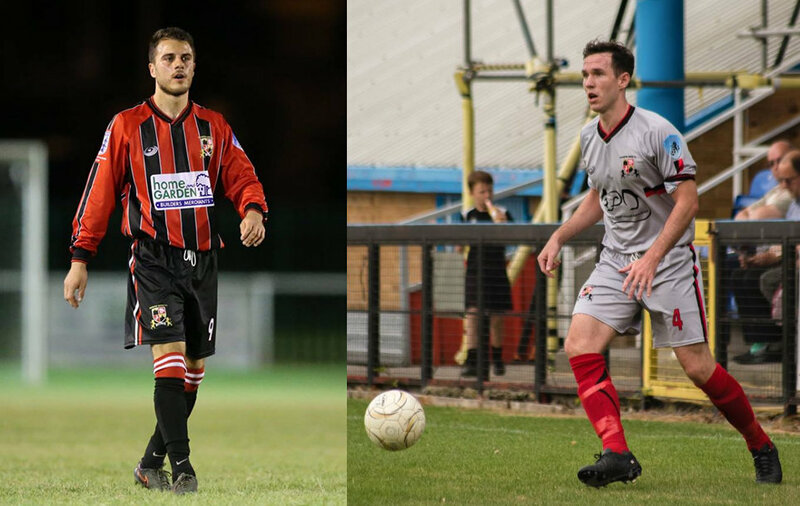 Thick Red and black striped shirt, black socks and shorts for home kit. Away kit is all light blue with darker blue trim. Salts FC (aka 'The Alpacas') - based in Saltaire, Shipley; play at Salts Sports Association in Saltaire. Founded 1923. Home kit is yellow shirt with blue socks and shorts. Away kit is white shirt with black shorts and socks. Whitkirk Wanderers (aka 'The Kirk') - based in Leeds; play at Selby Road , Leeds. Founded 1960. All blue home kit, with darker blue on the arms and chest. all orange away kit. Wyke Wanderers AFC - based in Cleckheaton; play at Whitechapel Road. Founded 2006. Home kit is white shirt with thick black bar down the middle of it (a bit like Ajax), black shorts and socks. Away kit is red and blue stripes, red shorts and blue socks. Level 10 teams are entered into the FA Cup But there are not that many from each league because of the 736 teams. Hey there. Long time lurker, first time poster. 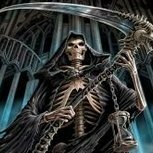 I downloaded your database last year for FM 18 and it was absolutely wonderful in every aspect. I just got FM 19 today on the winter sale and decided to get your database again for another managerial run with Hartley Wintney. As you can see on the picture I've provided, it seems the FA Cup is listed twice for some odd reason. I don't know if that's an error with the Database or an Error on my end. The only editor files I have installed are your database and the real name fixes from sortitoutsi. If there's a quick fix already, please let me know. Otherwise, I figured you might want to know about this. I have not altered the FA Cup name in my database so maybe it is something to do with the other file you have downloaded. 5 Leagues at Level 11 now fully completed. I need more info for other Leagues at Level 11 if anyone can help. 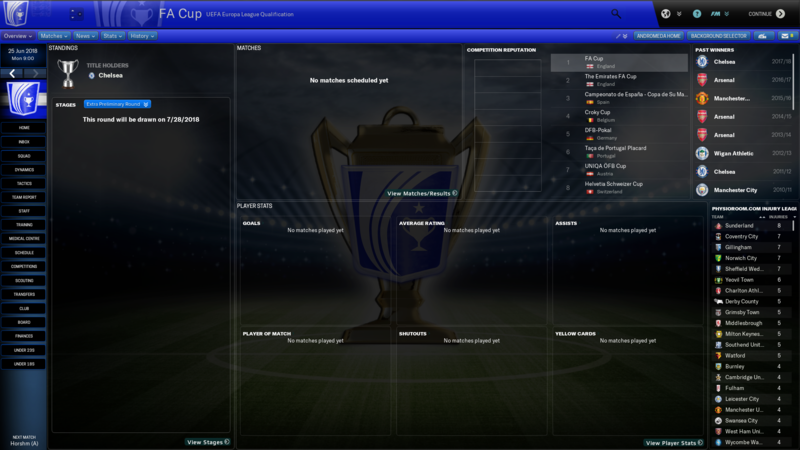 I think what has happened is I accidently deleted the FA Cup then recreated it to add in the extra preliminary rounds, that's why all the history went missing too, I will fix this soon. Quick question, Bostick 1 South East has 19 teams after season 1. I know that Thamesmead went under during the season. was wondering would you readjust the league to get all step 4 leagues to be 20 each in the season afterwards? Also I have noticed that no leagues have any games for Boxing Day/New Years Day/ Bank Holiday Monday (August) and Easter Monday? I am unsure of how to do it yet. I don't know if I will try to alter this or not yet, last year when I tried altering fixtures it really messed the database up and a lot of the league fixtures was played in midweek instead of the weekend. 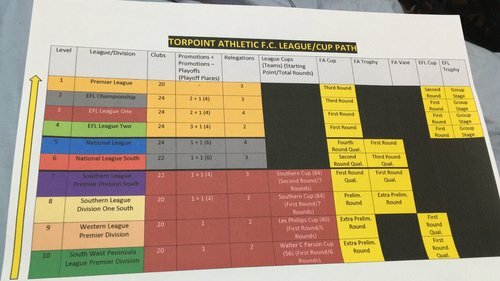 The new FA Cup will include much more teams at Level 10 than before. it is going to have to go back to how it was before with the 736 teams because having extra teams in just messes all the rounds up and teams coming in at incorrect rounds. I don't know how to stop the FA Cup appearing twice, I have tried several different things but it is always there. As I said earlier, best would be to undo the change where you deleted the original FA Cup (comp ID 1301426). 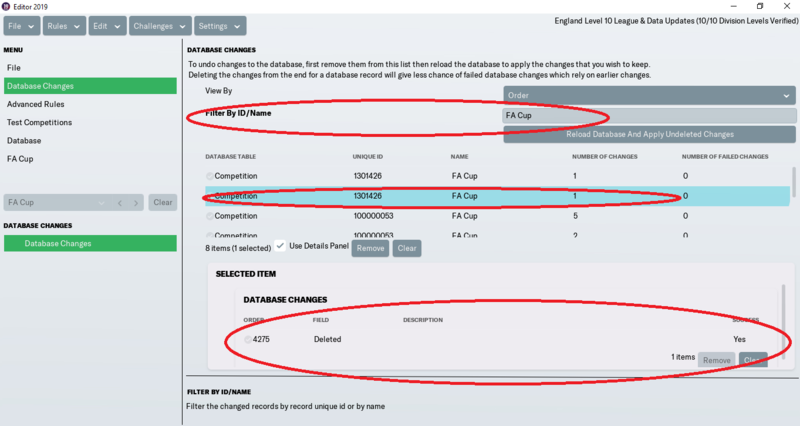 In Database changes, find it as I have shown here in the attachment and then remove that change, then click "Reload Database and Apply Undeleted Changes"
Having done that, I would recommend you try to delete the New FA Cup you made, 100000053. 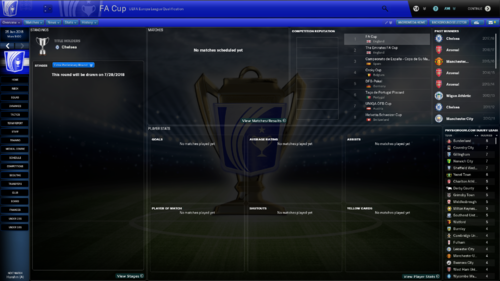 Under England -> Competitions you'll now have a blank, which you should replace with the original FA Cup. Under Advanced Rules find the blank and also replace competition with FA Cup. BTW, I would recommend that you change the fixture priority to "Domestic Cup - High" because at the moment the some rounds, especially the Semi-finals are being played mid-week because the Premier League takes precedence. And another thing is you don't have any TV Dates in. 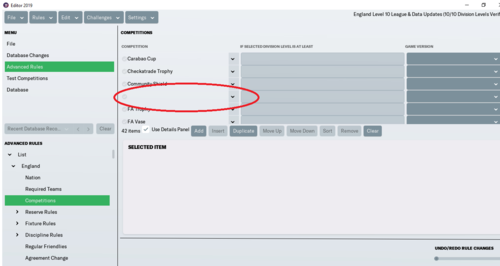 If you look in the Advanced Rules in your file, the original rules for the FA Cup are still there, you can easliy copy TV Dates and paste them by clicked on Edit button at the top. Thanks for all that. I think i have now fixed it. Just got a few more rounds to do and everything will be good. Moulton Harrox – Based in Moulton, Lincolnshire and play at Broad Lane. Home kit Blue with white stripes. Away is Yellow with green shorts. Netherton United – Based in Peterborough and play at The Grange which is a 3G floodlit pitch. Home kit is Red top, black shorts and away is White top and red shorts. Thorney FC – based in the village of Thorney, Cambridgeshire and play their games at Campbell Drive. Home kit is Yellow and Black shorts, with away white and black. Ketton FC - based in Ketton, Rutland, play at Ketton Sports and Social Club.Home kit is Blue and White shorts, away kit yellow and white stripes. When you edit kits with in-game editor, it autamticaly disables custom kits. When you're done editing, you have to tick option "show licenced kits" (also within in-game editor options). FA Cup/FA Trophy now working how it should. FA Cup Preliminary & Qualifying rounds now drawn regionally. FA Cup TV Dates now put in. FA Cup TV Money if tie is selected for TV coverage. City of cheddar co ordinates fixed, wrong co ordinates was set, they were going into southern counties east after 1st season. I can now continue adding data for Leagues at Level 11. 1st post updated with new file, also posted here. Nottinghamshire Senior League Senior Division data now added. 7 Leagues at Level 11 now completed. Really enjoying this database. Thank you. Have you done any tests on team finances after many years? (or long term tests in general) I'm interested in playing a really long career so I might edit the database a little bit so that new teams can enter the league and the finances are relatively stable. No I have not done any tests to see what the finances are like, but they should be able to make more money as they rise up the leagues with the FA Competitions. I think it is possible to do but I am not going to do it myself as I don't want to mess it up. My worry is more that most teams, who don't rise up the leagues, will all go into debt and be unable to get out of it. This happened to me with my own databases. I'm doing a test now but I only have my laptop with me so it will be slow. I can report back if it's of interest. I've also added in a fake "level 11" so that different teams will pop into the visible league structure as I go along. I'm also going to remove the rule preventing B-teams from being promoted just because I want to play with that challenge. I'd be happy to share this version if allowed. Does anyone know what this means? or how to fix it? I think I have fixed the problem I was having when I added in some of the Level 11 Leagues I had created. I was also having problems with teams moving into different Leagues at the start of the game but I know how to stop that now. Here is a few screenshots of the Level 11 Leagues. 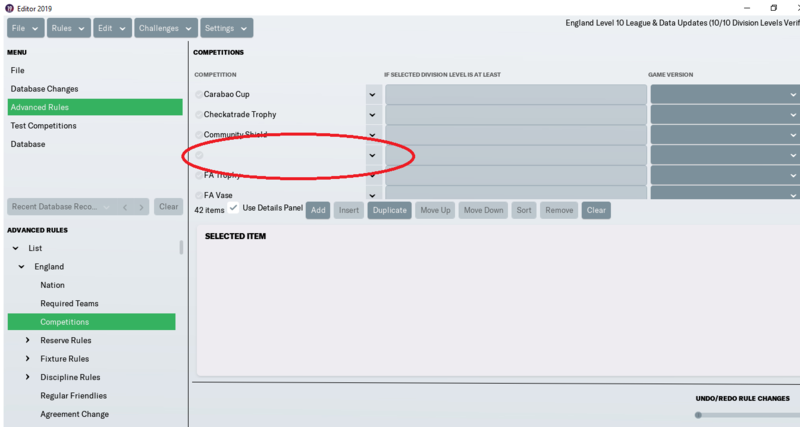 Has anybody had a problem with the FA Cup not working in Season 2019/20? I've got no fixtures coming up and I'm into October now. Northern Prem League Div 1. It worked fine in the first season when i was in the North eastern counties league. 17th December it looks like. Yes I'm keen to know which version as I'm about to download but stated the FA Cup should be fixed? First Kit Yellow shirts, blue shorts, blue socks. Will you tell me the divisions you have done so I don't post any which you've already done, cheers. These are the Leagues I have done. Central Midlands League Premier Division South. Humber Premier League Premier Division. Leicestershire Senior League Premier Division. Liverpool Premier League Premier Division. Mid Sussex League Premier Division. North Riding League Premier Division. Nottinghamshire Senior League Senior Division. Peterborough & District League Premier Division. Sheffield & Hallamshire County Senior League Premier Division. Southern Combination League Division 2. West Riding County Amateur League. 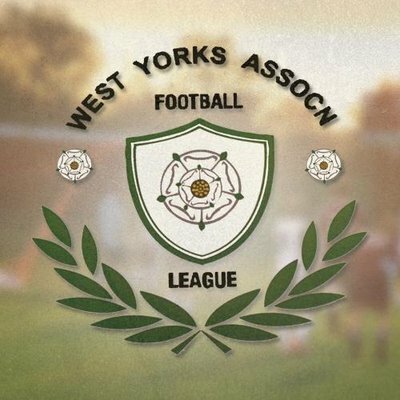 West Yorkshire League Premier Division. Wiltshire Senior League Premier Division. These are the Leagues I have info for and need to input data for.